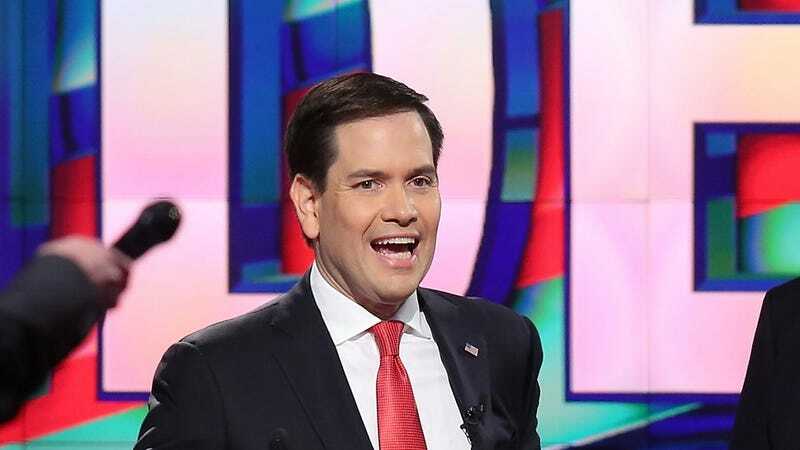 Poor Robo-Rubio got fed the wrong algorithm at tonight’s umpteenth GOP debate tonight—one that can only be described as a horrific mix between a socially-progressive hashtag (yay!) and a tweet from an evangelical mom (honey, no). In response to a completely unfounded comment made by Donald “Carnie Hands” Trump about “a lot of” Muslims hating America, Rubio and his SJW-welling Grinch heart decided to speak out. In an attempt to take a stance against the possible Garfield impersonator, the GOP hopeful proceeded to explain that Muslims are, to paraphrase, “v chill brah”—but only the ones that are ripe to convert to Christianity, who will serve and die in our military, or Muslims who, as Vox notes, we should be nice to “because it’s tactically advantageous” for our political means. This is what coded language was made for, apparently. “I know that a lot of people find appeal in the things Donald says, because he says what people wish they could say. The problem is presidents can’t just say anything they want. It has consequences — here and around the world. And so let me give you one: Two days ago, I met this extraordinary couple who are on furlough because they are missionaries in Bangladesh. It’s a very tough place to be a missionary. It’s Muslim. And their safety and security very much relies upon friendly Muslims that live alongside them — that may not convert but protect them and certainly look out for them. And their mission field really are Muslims that are looking to convert to Christianity as well. And they tell me that today they have a very hostile environment in which to operate in because the news is coming out that in America leading political figures are saying that America doesn’t like Muslims. So this is a real impact. There is no doubt that radical Islam is a danger in the world. So close, iRobot Rubio. So close.